This stock bill of sale form is completed when selling shares of common stock. This is the general bill which is used in all States of USA, but in case a State introduces its own stock bill of sale form, it should be used while entering into the transaction in that State. Every State has its own laws, rules and regulations to handle this bill and these should be studied, understood and followed in letter and spirit. 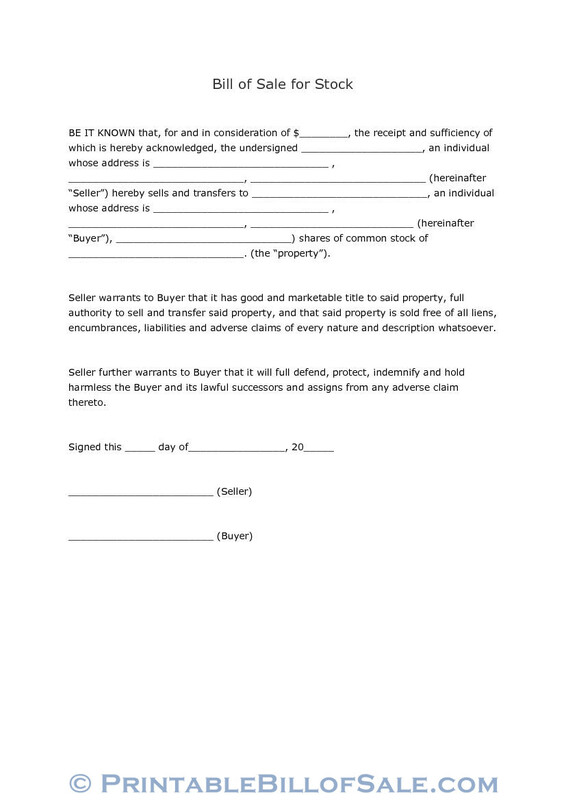 In this stock bill of sale form, all information about the seller and the buyer are given mentioning their full addresses. Date is also mentioned in this form. 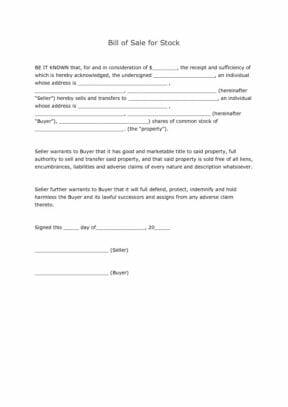 This form also contains the assurance from the seller that the property is not having any kind of burden. Further, the seller also ensures that he/she will defend the buyer against any adverse claims. In this part, the seller acknowledges the receipt of the amount and authorizes the person (buyer) to receive the shares. The amount for which the shares have been sold is mentioned in US dollar. The seller gives his/her full name and full address and also mentions the name of the buyer with full address. In this section, the seller assures the buyer that he/she is the legal and legitimate owner of this property and is fully authorized to sell and transfer the same to anybody he/she likes. The seller further warrants that this property is devoid of all burdens, liens and hindrances and adverse claims of all natures and forms. In this part, the seller ensures the buyer that he/she (seller) will protect, defend and save the buyer and his/her legal heirs/successors from any adverse claims. In this part, date, month and year are mentioned.